Last night was the annual Fam Tour of Springtide Charters Whale Watching. Guests attended from tourism and hospitality businesses across greater Victoria. Our hosts Captain Dan and Joanne, the owners of Springtide, had their boats and staff decorated with a Canada Day theme and guest were asked to dress in red and white. It sure made it easy to spot guests as they gathered in front of Milestones at wharfside. Fiona, the party organizer and her sidekick Carlie did a wonderful job. There was plenty of great food (supplied by Island Gourmet Caterers at the Ambrosia Centre), and lots to drink (Wine from Church and State Wines, beer from Darcy's Pub). Music was provided by a band called On Fire. 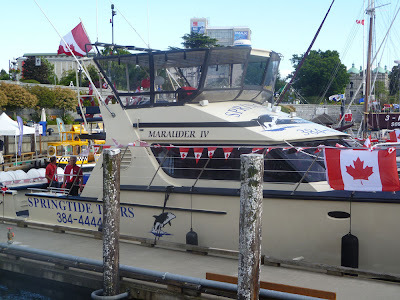 The Marauder cruised around the Inner Harbour as the party unfolded and captain Jeff brought the large Zodiac along side and took groups of partygoers out for some excitement in Juan de Fuca Strait. They all reported back about how much fun it was, despite a few messed up hairdos. The staff appeared as if they really enjoyed working for Springtide. As hard as they were working, they had smiles on their faces all night long. Springtide is one of the best whale watching companies in Victoria and they have great experienced staff. You can be guaranteed that if you go on one of their tours, they will do all they can to make sure it is a memorable experience. Having been out with them several times, I can attest to the great job they do. You will find no boat more comfortable for an on-water excursion and it is more than fast enough to get you out to the whales. I'm sure I can speak on behalf of all the attendees that the event was a smashing success and that everyone went home more happy than they arrived. Thanks to all the staff who worked so hard to make it happen and to Joanne and Dan for hosting the event For more pictures of this event, please go to our Facebook Site.